Left to right; Jeremy Schultz Electronic Content Systems Manager; Patti Corso Catalog Manager Winhere Brake Parts, Inc.; Efrain Tena Electronic Catalog Systems Manager O'Reilly Auto Parts. May 1, 2018 (Bartlett IL)- O’Reilly Auto Parts has honored Winhere Brake Parts Inc. with their coveted Receiver’s Choice award for catalog excellence at the Automotive Content Professionals Network (ACPN) Knowledge Exchange Conference in Ft. Worth, TX. 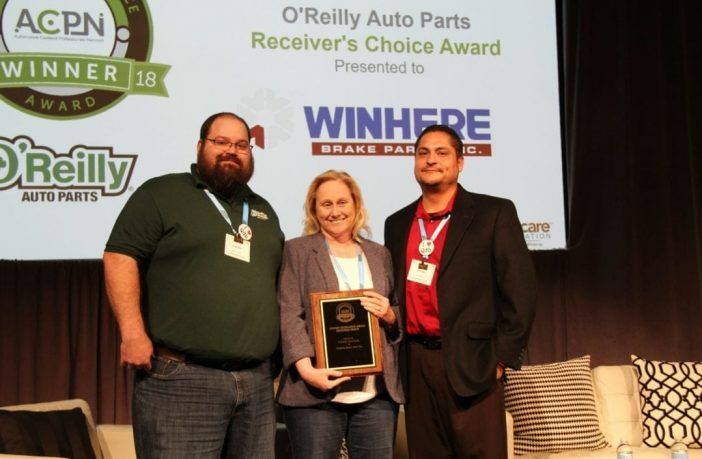 The Automotive Content Professionals Network (ACPN), a community of the Auto Care Association a honors recipients of its ACPN Content Excellence Awards and Receiver’s Choice Awards at its 2018 Knowledge Exchange Conference in Ft. Worth, Texas. The awards recognize the best examples of print and electronic cataloging in the vehicle aftermarket. Catalogs are judged on a variety of criteria ranging from compliance with best practices to readability and technical accuracy, innovation, interactivity and quality of content.